Tribunals are quasi-judicial institutions established to help solve the problems of pendency and delay. In this chapter, the authors conduct an empirical study to examine the efficiency and efficacy of the Karnataka Appellate Tribunal (KAT), and understand whether it has fulfilled its goals in terms of reducing pendency and delay. The authors evaluate whether the KAT works efficiently by disposing of cases, and whether it acts as an effective court of appeals and reduces the caseload of the High Court of Karnataka. 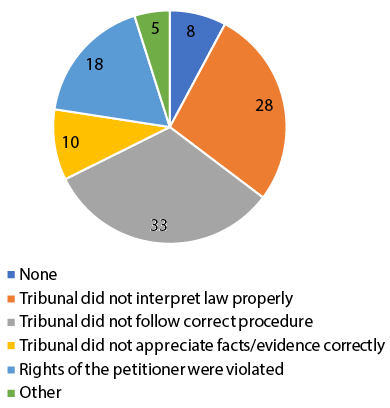 This discussion about the efficiency and efficacy of tribunals, and the possible consequences of tribunalisation is almost entirely situated in logical and legal reasoning, with sparse empirical evidence on whether tribunals are efficient, that is, whether they are good at disposing cases and managing their pendency (number of cases), and whether they are efficacious, that is, whether they are good at acting as an effective court of appeals and reducing the caseload at the appellate court. There have been a few individual case studies of tribunals in India that seek to measure their performance and impact. For instance, Sujata Visaria and others have studied the effect of the debt recovery tribunals on loan recovery to see if these bodies have reduced delinquency.10 Further, Prasanth V. Regy and Shubho Roy have studied judicial delay in debt recovery tribunals based on a granular study of a sample of cases, to answer the question of why delays are caused and by whom.11 Recently, Vidhi Centre for Legal Policy has carried out a useful statistical analysis on the efficiency and efficacy of certain tribunals in India.12 Vidhi examined the disposal rates for two major tribunals — the Telecom Disputes Settlement and Appellate Tribunal and the Intellectual Property Appellate Board.13 Their study looked at the question of efficiency by calculating the disposal and pendency rates of cases in a given year, compared to the disposal rate of the High Courts.14 To determine efficacy, they analysed a sample of judgments from each of the tribunals chosen to assess whether that tribunal met the standard of judicious decision-making, as well as judgments of superior courts that have taken up cases in review or appeal (writ or through statutes) from the tribunal’s orders, to see whether the courts have largely agreed or disagreed with the tribunal.15 Our study aspires to add to this body of empirical research to provide insights into whether the tribunal architecture is being able to meet, at least to a substantial degree, the goals it was envisaged to fulfil. Three situations are possible once a case is registered at the KAT. First, that the case is pending and undecided at the KAT; second, that the case is decided and resolved at the KAT with no further appeal; and third, that the case is decided at the KAT and is appealed to the High Court of Karnataka. Once a case has been appealed, the High Court of Karnataka can either allow the appeal and reverse the KAT judgment or dismiss the appeal. In the following sections of this chapter, we hope to arrive at two key measures of performance of the KAT. The first of this is efficiency, that is, whether the KAT is efficient at managing internal case flow, by reducing number of cases pending, increasing disposals (and disposal rates) over time. If the KAT is not efficient at this, it is not working as a good cog in the wheel of the justice system and such issues might need to be addressed. The second measure of performance we are considering is that of efficacy, that is, the extent to which the KAT has been able to fulfil its purpose in reducing the number of cases that are appealed to the High Court of Karnataka under the relevant statutes. If the KAT is not efficacious at limiting appeals and is reversed often, whatever the grounds of these appeals may be, it is an inefficient way to diversify caseload. If the grounds upon which decisions of KAT are challenged and reversed pertain to interpretation of substantive or procedural law, or concerns about natural justice, there might be evidence for concerns about composition of tribunals and the strategy of diversification to quasi-judicial adjudicatory bodies. To understand whether the KAT is fulfilling its purpose in reducing caseload at the High Court of Karnataka, first we need to understand whether the KAT is efficient in and of itself. While there are many ways to measure efficiency such as studying individual case flow, trial duration, delay, inter alia, the data for that kind of study is not available. We have confined ourselves to an analysis of disposal rate based on data made public by the KAT. To do this, we have sourced data on case filings and pending cases from the KAT’s official website. The official website only has data on the filing of new cases and on pending cases for 2012–2017. For our analysis, we had to arrive at the data on the number of disposed cases for 2013–2017, since this is not directly available on the website. We will also rely on disposal rate, defined as the percentage of filed and pending cases for a year that are disposed in that year, as a metric of this efficiency. If pending cases and caseload are increasing while disposal rates decrease over time, the obvious conclusion is that the KAT is not efficient and these concerns must be addressed. As can be seen from the numbers, overall, the number of new cases filed increased between 2012 and 2016. 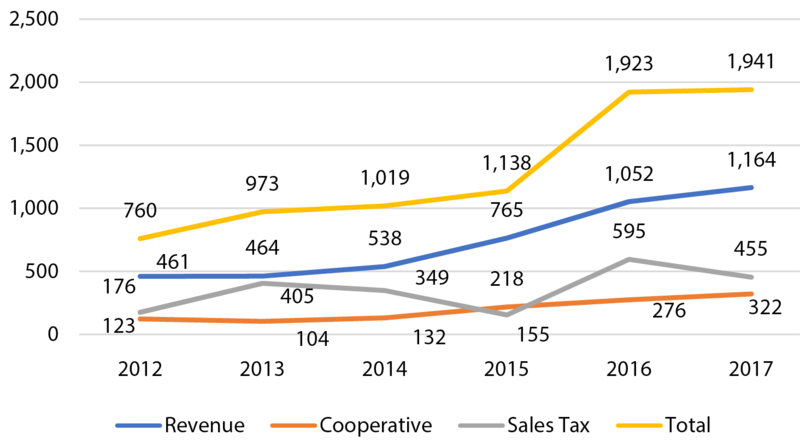 This particularly true of revenue cases which saw a steady incline, whereas filings for cooperative societies’ cases dipped in 2013 and 2014, and filings for sales tax cases fluctuated from highs in 2013 and 2016 to lows in 2012 and 2015. What can be seen in Table 2 and Figure 2 is that while there was a dip in overall disposal in 2016, there was a dramatic rise in 2017. While disposal of revenue and cooperative societies’ cases increased every year, disposal of sales tax cases fluctuated, with a high of 778 disposals in 2014 and a dip to 408 cases in 2016, while 2017 could be the best year for disposal in this category with 633 cases disposed and a quarter of the year remaining (as of the time of writing). As can be seen from Table 3 and Figure 3, the number of pending cases at KAT increased steadily every year, with a dramatic, almost threefold rise from 2012 to 2016. Pending cases for revenue cases and cooperative societies cases also increased more than twofold between 2012 and 2016. Both these categories saw steady increases in disposal, and this corresponds to an increase in filing of new cases over the years. The number of pending sales tax cases peaked in 2013, dipped in 2015, and increased again in 2016. 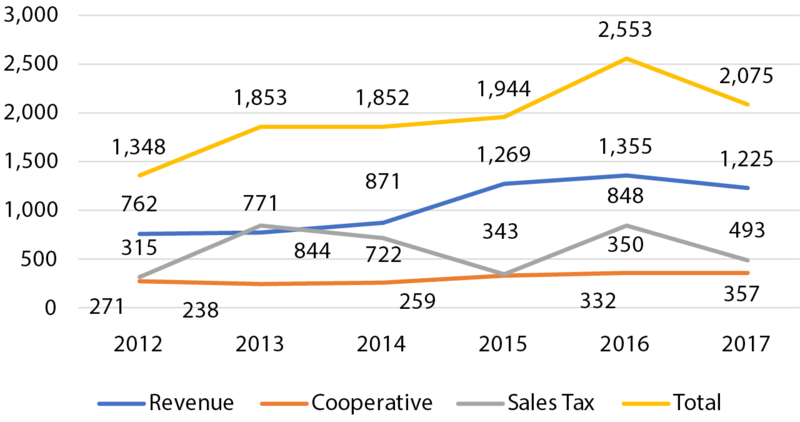 The peak in 2013 corresponds to an increase in the number of new cases filed, which is its likely cause, as the disposal of sales tax cases held steady at 615 that year. The dip in pending cases at 155 in 2015 also corresponds to a peak in disposal in 2014 (as seen from Figure 2) coupled with a decrease in new cases filed. What is evident is that increasing number of pending cases corresponds to the increase in the filing of new cases every year. The KAT cannot do much about an increase in case filings year on year, but to understand if the KAT is responding well to this, we need to look at the disposal rate. Applying this formula, disposal rate for each year is shown in Table 4, and the trends over the selected years are given in Figure 4. As can be seen from Table 4 and Figure 4, the overall disposal rate increased to 63 per cent in 2014 and plummeted to about 39 per cent in 2016, crawling back up to 51 per cent in 2017. This can be related to a corresponding increase to 72 per cent in 2014 and 107 per cent in 2015 and a decrease to 28 per cent in 2016 in sales tax disposal rates. 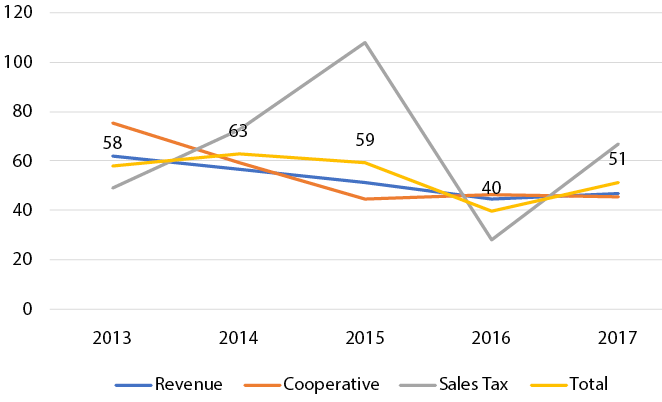 Revenue disposal rates steadily decreased until they increased somewhat in 2017 and disposal rates of cooperative societies’ cases declined dramatically, until they improved slightly in 2016. What this tells us is that although sales tax cases occupy the most resources from KAT with four courtrooms (eight judicial and technical members) dedicated to them, they see astonishing highs and lows when it comes to efficiency in disposal. Courtrooms dealing with revenue and cooperative societies’ cases also saw a general trend of decline during these four years. The disposal rate was at its lowest in 2016, due to the sharp rise in number of cases filed, the decrease in number of cases disposed, and the sharp increase in pending cases that year. Between 2013 and 2017, the number of pending cases as well as the filing of new cases soared, while disposal rates, despite seeing highs and lows, reduced overall. This shows an inefficient system that is not responding well to demand. None of 156 these benches at the KAT are performing consistently and efficiently. They seem to be failing to dispose cases faster than traditional courts. At the very least they are an inefficient cog in the justice system. However, it is worth mentioning here that the court’s performance has overall been far more efficient in 2017. Given that the year is yet to come to an end (at the time of writing this), it remains to be seen whether this is a new trend or an outlier. From the above, we understand that the KAT is not a very efficient quasi-judicial institution. To understand if it fulfils its purpose of reducing the burden on the High Court of Karnataka in these matters and if it is an efficacious court of appeals, we will need to understand the rate at which cases resolved at KAT are appealed to the High Court. The second measure of performance we are considering is that of efficacy, that is, whether the KAT is efficient at fulfilling its purpose in reducing the number of cases that are appealed to the High Court of Karnataka. If the KAT is inefficient at limiting appeals and is reversed often, whatever the grounds of these appeals may be, it is an inefficient way to diversify caseload. If the grounds for these appeals are concerns about procedural fairness and legal interpretation, there might be evidence for concerns about the composition of the KAT. To arrive at a measure of efficacy, we will trace (a) the rate of appeal, defined as a percentage of cases disposed by the KAT that are appealed to the High Court of Karnataka,22 (b) the grounds upon which these cases are appealed, and (c) the reversal and dismissal rate of these appeals. Data on appealed cases is available on the KAT website. We went through individual orders and judgments uploaded on http://judgmenthck.kar.nic.in for all the cases that were appealed from the KAT to the High Court of Karnataka during one test year, 2014. These appeals have been decided by the High Court of Karnataka at any time between 2014 and 2017. Further, to understand the grounds upon which cases were appealed against the orders of the KAT in the High Court of Karnataka and the outcomes of these appeals, we analysed judgments of the High Court. We chose the year 2014 keeping in mind that a case in any court in India is considered delayed if it is not decided within two years,23, (assuming that cases at the end of 2014 would only be appealed in 2015), cases decided between 2014 and 2017 that challenge an order of the KAT passed in 2014 is the most recent and best data we can find on the performance of the court. To arrive at the number of cases appealed, we searched for ‘Karnataka Appellate Tribunal’ on the website (http://judgmenthck.kar.nic.in) and organised the resulting cases by date of judgment. We got 1,305 results, with judgment dates between 1 January 2014 and 28 August 2017. We manually sorted through these search results to arrive at the relevant cases. For our analysis, a case was considered only if it is a challenge to a KAT order passed in 2014. We excluded from our analysis cases such as contempt petitions seeking to force parties to comply with the KAT order, cases which are filed to extend KAT orders, and so on. Thus, the only cases we considered are those where KAT orders passed in 2014 were challenged on the merits, or on procedural grounds — which numbered 120. In order to arrive at an answer to the question of whether the KAT is efficacious, we scrutinised the total number of disposed cases that were appealed, and the number of these decisions that were reversed. Table 5 provides the details. We found that of the total disposed cases in 2014, four per cent of tax cases, 17 per cent of cooperative society-related cases, and 6 per cent of the land revenue related cases were appealed. 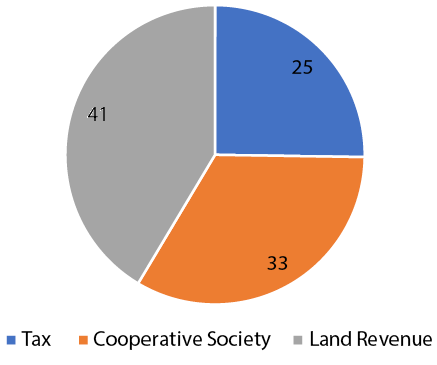 The total appeal rate is 7, which is not too high, but what is concerning is the appeal rate with cooperative societies’ cases (17), since it is outsized, simply because the number of disposed cooperative societies’ cases is about a one-third of disposed land revenue or sales tax cases. Further, the number of disposed sales tax and land revenue cases is 778 and 797 respectively, and the appeal rates for those categories are 4 and 6 respectively. That is a huge difference in terms of efficacy. All of this causes some concern about the efficacy of not only the revenue and cooperative societies’ courts at the KAT, but about the efficacy of the KAT itself. 2. Rights of the petitioner were violated. 3. The tribunal did not appreciate the relevant facts or evidence properly. 4. The tribunal did not interpret the relevant law properly. 5. The tribunal did not follow the correct procedure. Of the 120 judgments, we found that an overwhelming 79 per cent were comprised of writ petitions. 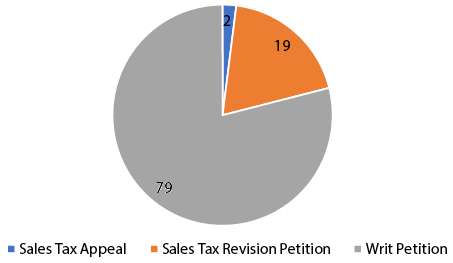 Sales tax revision petitions were the next highest category, with around 19 per cent of the total number of the cases filed. Only 2 per cent of the cases were sales tax appeals. This is shown in Figure 6. As mentioned earlier, the Karnataka Cooperative Societies Act, as well as the Karnataka Land Revenue Act allow for appeals only to the Tribunal, and Section 9 of the KAT Act clearly states that the decision of the tribunal is final and binding. Therefore, it is perhaps inevitable that the petitioner who is aggrieved by any decision of the KAT would have no choice but to file a writ petition. This is concerning, as it ultimately does not provide for a clear procedure or a limitation period for an appellant aggrieved by an order of the KAT to approach the High Court. It seems to be a loophole in legislative drafting, and is something that ought to be reviewed by lawmakers in the interest of speeding up matters that do reach the High Court from the KAT. Note: Figures represent percentages (rounded off). 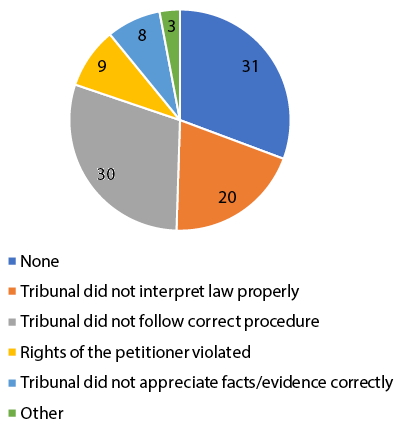 In approximately 59 per cent of the cases, KAT orders are challenged on grounds of procedural infirmities, improper appreciation of facts or evidence, and where the petitioners felt that their rights were being violated. These grounds lend credence to concerns about the composition of the KAT and tribunals as a whole. To understand efficacy, another measure we considered is the frequency with which the High Court of Karnataka reversed the orders of the KAT in appealed cases. Often cases are not appealed for any number of reasons, from high cost of litigation to compromises being worked out. Reversal rates are a sharper picture of the performance of a court. As shown in Table 6, of the appealed cases, 50 per cent of the decisions were reversed in tax-related matters, 27 per cent reversed in land revenue matters, and 30 per cent were reversed for cooperative societies matters. Overall, one-third of the appealed cases were partly or fully allowed by the High Court of Karnataka. Clearly this is a high reversal rate for any court. 159 This paints a sobering picture for the KAT and adds strength to doubts about the composition of tribunals, and whether this is the appropriate judicial structure for deciding these cases. In terms of outcomes, we found that the 66 per cent of cases were dismissed by the High Court of Karnataka. While 16 per cent of the cases were dismissed as withdrawn, which is possibly due to compromises being worked out between parties, 28 per cent of the petitions were allowed, and 5 per cent were partly allowed. Only one per cent of the cases was adjourned, with no clear outcome. Of all the cases that were allowed or partly allowed, Figure 8 shows the various grounds on which they were appealed. Of the cases that were overturned, 33 per cent were on procedural grounds, 18 per cent of cases were on grounds that the rights of the petitioners had been violated, 10 per cent of the cases were on grounds that the facts of the case or evidentiary matters were not pursued properly by the KAT, and 28 per cent were on ground that the tribunal had not interpreted the relevant law properly. For the remaining 8 per cent, the judgment from the High Court did not specify any grounds. The efficiency of the KAT cannot be said to be optimum, given the trends in terms of number of pending cases and disposal rates. Disposal rate seems to be plummeting unsteadily as both pending cases and new cases filed seem to be increasing. While this is limited data, it does point to concerns about efficiency of the KAT, which must be addressed. It also leads to doubts about arguments in favour of diversification that are based on efficiency of the tribunals and other quasi-judicial institutions. On efficacy, the data is a little more complex. While the appeal rate per se is low at seven, the data from the appeals section reveals that the KAT’s decisions are overturned disproportionately by the High Court of Karnataka, at 33 per cent. Most of these cases are appealed on procedural grounds, as well as on grounds that the KAT is not interpreting the law or facts or evidence properly. In nine per cent of these cases, petitioners’ rights or natural justice is explicitly evoked by the petitioners. This lends some credence to the argument that the composition of the KAT, with the inclusion of technical members matched one-to-one with judicial members, may lead to miscarriage of justice especially in cases involving procedural fairness. Further empirical analyses could examine the question of how to ensure better efficiency and efficacy of the KAT, either by improving the management of tribunals or by alternative judicial structures. * The authors are grateful to Harish Narasappa, Shruti Vidyasagar, and Arun Thiruvengadam for their valuable comments and feedback. They would also like to thank Sudhir Krishnaswamy for his insights. 1. Arrears Committee. 1990. Report of the Arrears Committee 1989-1990. New Delhi: Government of India, p. 100. Available online at http://dakshindia.org/wp-content/uploads/2016/08/Malimath-89-90.pdf (accessed on 18 October 2017). 2. Arun K. Thiruvengadam. 2015. ‘Tribunals’, in Sujit Choudhry, Madhav Khosla, and Pratap Bhanu Mehta (eds. ), The Oxford Handbook of the Indian Constitution, pp. 412–431. New Delhi: Oxford University Press. 3. Nick Robinson. 2015. ‘Judicial Architecture and Capacity’, in Sujit Choudhry, Madhav Khosla, and Pratap Bhanu Mehta (eds. ), The Oxford Handbook of the 161 Indian Constitution, pp. 330–348. New Delhi: Oxford University Press, p. 340. 4. V. Nageswara Rao and G.B. Reddy. 1997. ‘Doctrine of Judicial Review and Tribunals: Speedbreakers Ahead’, Journal of the Indian Law Institute, 39(2): 411–423. 6. T.V. Somanathan. 2015. ‘The Administrative and Regulatory State’, in Sujit Choudhry, Madhav Khosla, and Pratap Bhanu Mehta (eds. ), The Oxford Handbook of the Indian Constitution, pp. 386–411. New Delhi: Oxford University Press, p. 405. 7. Law Commission of India. 1958. Report No. 14: Reform of Judicial Administration. New Delhi: Government of India, p. 692. Available online at http://lawcommissionofindia.nic.in/1-50/Report14Vol2.pdf (accessed on 17 October 2017). 8. Somanathan, ‘Administrative and Regulatory State’, p. 386. 9. Arun K. Thiruvengadam, ‘Tribunals’, pp. 411-423. 10. Sujata Visaria. 2009. ‘Legal Reform and Loan Repayment: The Microeconomic Impact of Debt Recovery Tribunals in India’, American Economic Journal: Applied Economics, 1(3): 59–81; see also Ulf Von Lilienfeld-Toal, Dilip Mookherjee, and Sujata Visaria. 2012. ‘The Distributive Impact of Reforms in Credit Enforcement: Evidence from Indian Debt Recovery Tribunals’, Econometrica, 80(2): 497–558. 11. Prasanth V. Regy and Shubho Roy. 2017. Understanding Judicial Delays in Debt Tribunals. New Delhi: National Institute for Public Finance and Policy (NIPFP). Available online at http://macrofinance.nipfp.org.in/PDF/RoyRegy2017_judicial-delay-debt-tribunals.pdf (accessed on 18 October 2017). 12. Vidhi Centre for Legal Policy. 2015. ‘State of the Nation’s Tribunals’, 5 April, available online at https://vidhilegalpolicy.in/events-updates/2015/5/19/state-of-the-nations-tribunals (accessed on 18 October 2017). 13. Vidhi, ‘State of the Nation’s Tribunals’. 14. Alok Prasanna Kumar and Rukmini Das. 2014. State of The Nation’s Tribunals: Introduction and Part 1: Telecom Disputes Settlement and Appellate Tribunal. New Delhi: Vidhi Centre for Legal Policy, p. 17. Available online at https://static1.squarespace.com/static/551ea026e4b0adba21a8f9df/t/55704d3be4b06ce94faf1b3b/1433423163564/140618_State+of+the+Nation%27s+Tribunals+-+TDSAT.pdf (accessed on 18 October 2017). See also, Alok Prasanna Kumar and Ketan Paul. 2014. State of The Nation’s Tribunals: Introduction and Part 2: Intellectual Property Appellate Board. New Delhi: Vidhi Centre for Legal Policy, p. 17. Available online at https://static1.squarespace.com/static/551ea026e4b0adba21a8f9df/t/5570341ae4b0b7fae0aa395a/1433669017863/140708_State+of+the+Nation%27s+Tribunals+-+IPAB+Final+Draft.pdf (accessed on 18 October 2017). 15. Kumar and Das, State of the Nation’s Tribunals Introduction and Part 1, p. 18; Kumar and Paul, State of the Nation’s Tribunals: Introduction and Part 2, p. 18. 16. Karnataka Appellate Tribunal Act, 1976. 17. Official information about the Karnataka Appellate Tribunal is available online at https://kat.karnataka.gov.in/about-us (accessed on 18 October 2017). 18. Section 8-A, Karnataka Appellate Tribunal, Act 1976. 19. The website of the Karnataka Appellate Tribunal is https://kat.karnataka.gov.in/home (accessed on 18 October 2017). 20. See https://kat.karnataka.gov.in/mis?p_p_id=mishome_WAR_kaptportlet&p_p_lifecycle=0&p_p_state=normal&p_p_mode=view&p_p_col_id=column-1&p_p_col_count=1&_mishome_WAR_kaptportlet_action=pending-cases&_mishome_WAR_kaptportlet_backURL=%2Fmis&_mishome_WAR_kaptportlet_type=1 (accessed on 18 October 2017). 21. The data for this is not directly available on the KAT website. Since we had to calculate disposal data from data available on new cases and pending cases, we did not have data to calculate the disposal numbers for 2012. 22. Theodore Eisenberg. 2004. ‘Appeal Rates and Outcomes in Tried and Nontried Cases: Further Exploration of Anti-Plaintiff Appellate Outcomes’, Journal of Empirical Legal Studies, 1(3): 659–688. Available online at http://scholarship.law.cornell.edu/cgi/viewcontent.cgi?article=1366&context=facpub (accessed on 18 October 2017). 23. This is the definition set by the Law Commission of India. For a discussion on the definition of delay, see Alok Prasanna Kumar. 2016. ‘Judicial Efficiency and Causes for Delay’, in Harish Narasappa and Shruti Vidyasagar (eds. ), State of the Indian Judiciary: A Report by DAKSH, pp. 93–101. Bengaluru: DAKSH and EBC. Available online at http://dakshindia.org/state-of-the-indian-judiciary/20_chapter_09.html#_idTextAnchor231 (accessed on 18 October 2017). 24. Section 8-A, KAT Act, 1976. 25. Section 9, KAT Act, 1976. 26. For one of the cases, it was not possible to identify which category it fell under even after reviewing the judgment and order sheet, and so that has been excluded. 27. It is pertinent to note that in this specific case, the petition was later dismissed as withdrawn because the tribunal started functioning, and the petitioner preferred to approach it.